I am needing a little Christmas. When our last child left home in 1995 I did not put up a Christmas tree or decorations for the next nine years. Our youngest daughter and her husband came out for Christmas in 2006 and I had the tree up that year. The next year, 2007, Joe was in the hospital being treated for Prostate Cancer and I had the tree up that year. My poor Joe. He was beside himself that year (2007). He had convinced himself that he had ruined my Christmas by being in the hospital. The tree was up that year and brightly lit for his arrival home. That was the last year the tree was up. This year I have decided to get with the program and begin the Christmas decorating of my home. First I have to clean my house before I begin. Not the whole house just the Master Bedroom and a little corner of the Living Room where the tree will be. 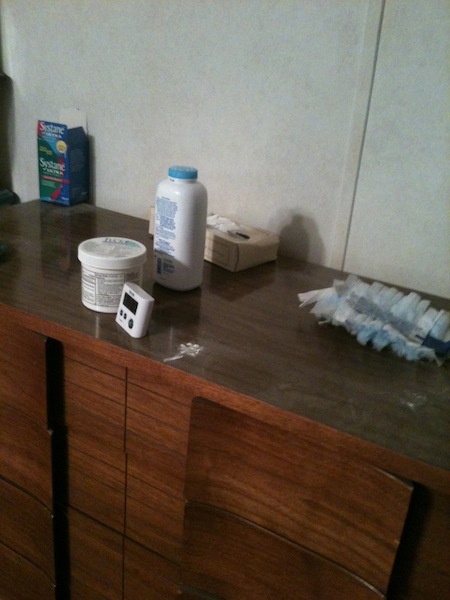 This current week , November 19th through the 26th, the Cleaning Zone the Flylady way is the Master Bedroom. Having been gone most of the week traveling to and from Colorado and Thanksgiving yesterday I have not done any cleaning in the Master Bedroom. Flylady has a section on her website for Crisis Cleaning. This is when you have CHAOS – “C”an’t “H”ave “A”nyone “O”ver “S”yndrome. “Crisis Cleaning” is done in her 15 minute increments. Begin in one room for 15 minutes then go to another room for the next 15 minutes, then on to another room for 15 minutes, then you get a 15 minute break. After the rest period is over you go back to the first room for 15 minutes and continue on until you have the work done. Hopefully long before you collapse in fatigue. Hidden under all this stuff…oh don’t you just love my door stop :-)….is a scroll saw, a bench grinder, and a stand for the scroll saw. 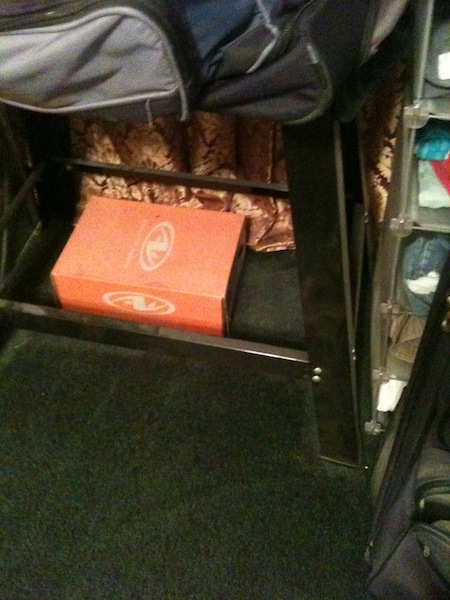 The stand currently props up the duffel bag suitcase we take out on the road with us. 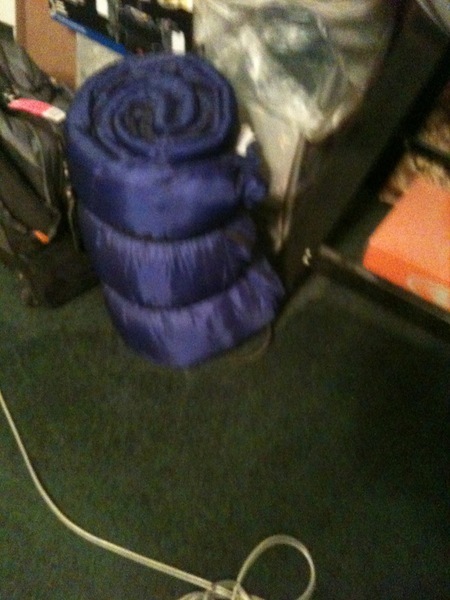 This sleeping bag is part of the “dump and run” during our brief times at home. Dust is all over in this room and it is pretty bad. 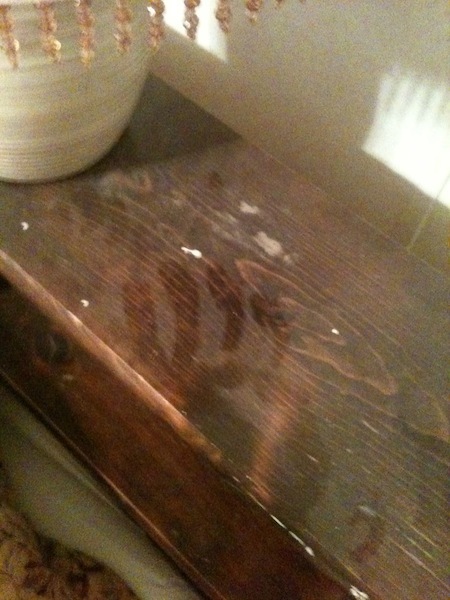 More dust on the dresser and the headboard of the bed. The plan is to spend 15 minutes in the Master Bedroom dusting and vacuuming then go in the Living Room for 15 minutes. Things were working out pretty well….at first. I intended to get the corner of the Living Room cleaned where the Christmas tree resides in its bag. That is the red thing leaning against the wall in the above photo. I have a bookshelf in the corner that needs to be tended to so I don’t knock the books off when I put the tree up. The whole space needs to be vacuumed and dusted. It is just as bad as the bedroom. Okay, things were going along really well. The bedroom curtains were in the wash. Joe was fixing the curtain rod that had gone all wonky from our dog lying on the bottom of the drapes that puddled on the floor. 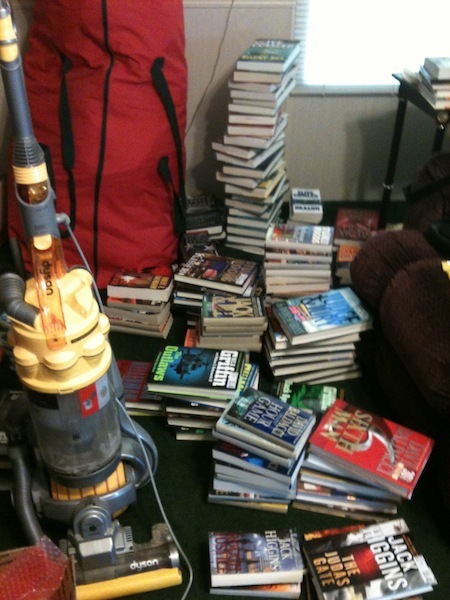 Things were going well until….I decided to clean off the bookshelf. One pile of books lead to another pile of books, which lead to another pile of books. 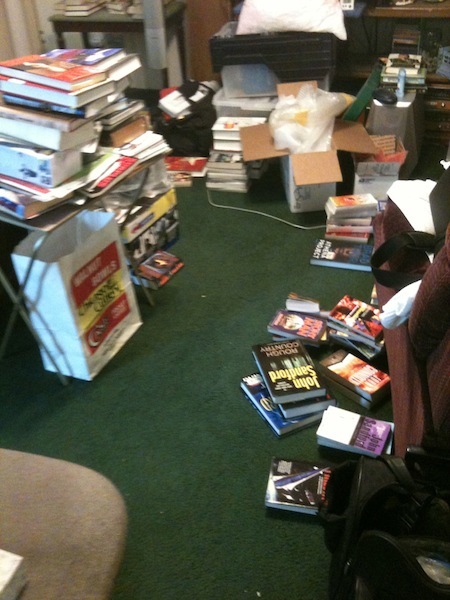 All to dust and clean off the bookshelf. The books have taken up the whole floor. 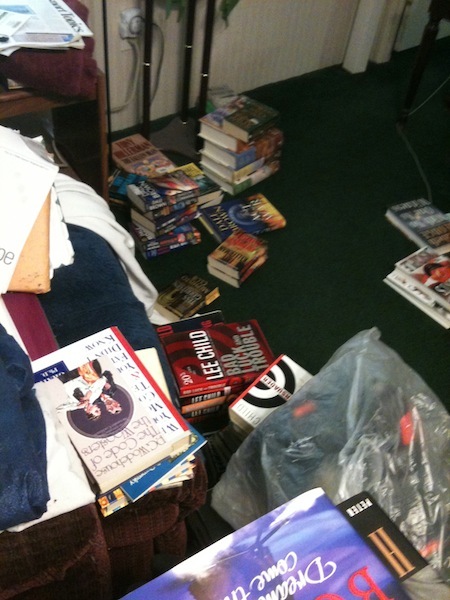 And more piles of books. Now I have two rooms that are a total wreck right now. There are paths through these rooms and I’m thinking I’ve gone and done just exactly what Flylady says NOT to do. 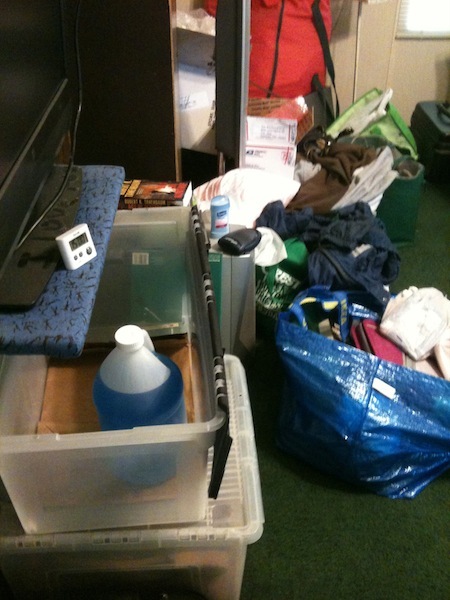 Flylady says not to make a mess that will take longer than 15 minutes to clean up. 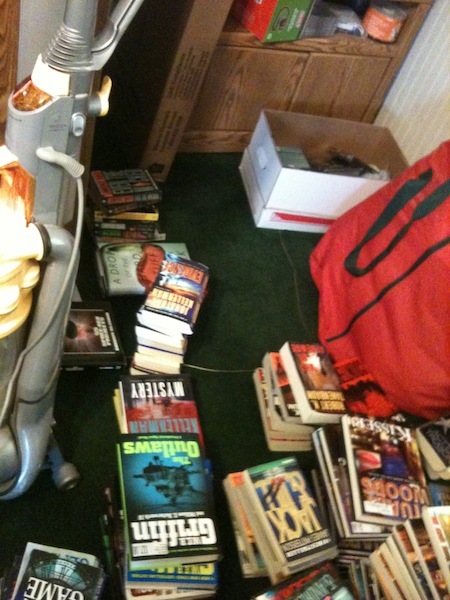 So the rest of today I will be making an attempt to put the books back on the shelves. Don’t quite know how I’m going to accomplish this task because there are more books than shelves to put them on 😦 Good grief. I have made a huge mess for myself. All to clean out one little corner of the Living Room to put the Christmas tree up and catch up on this week’s zone work in the Master Bedroom. So, take this as a cautionary tale. This is how NOT to clean the Flylady way. 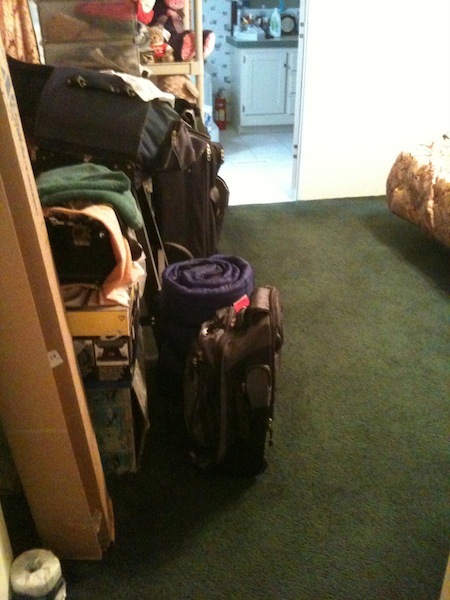 This entry was posted on Friday, November 25th, 2011 at 2:14 pm	and posted in Flylady - Sort of, Foolishness at HOME. You can follow any responses to this entry through the RSS 2.0 feed. How about only keeping the books that are not at your local library? Find a women’s shelter or assisted living facility to donate them to; you can get a tax deduction at the same time, and that leaves alot of shelf space available for other items that you might use more than once every 10 years like those books! And how about hinting to your kids that a kindle or nook (sp?) would be a great Christmas gift?!!! I will, most definitely, find a women’s shelter and an assisted living facility the next time we get rid of a bunch of books. Thanks for reminding me of these places. They are in more need of these than the library is. P.S. You are making progress, be it the fly lady way or NOT the fly lady way. So no beating yourself up over it! Have your EVER done ANYTHING exactly the way someone told you before? I thought not. Be proud of the work that you have done, for you have done it WELL, and that’s all anyone should expect! Send them all to me 🙂 They will have a good home here! You are doing well Leslie so let’s not hear any more of knocking yourself. Yes the work would have been finished before BUT you would not have seen Tiffany, SIL and Simon. Anyway there are times when you need to make a mess to clean a mess, just remember that mess didn’t get made overnight so the clean up isn’t going to happen overnight either. Don’t let it get you down, enjoy your time at home whether it is dusing a shelf or playing in your craft room – you are healthy, fit and alive so make the most of those moments. Nancy, I’m glad this post brought laughter to you 🙂 My old ways always have to take over from time to time and mess me up 🙂 I figure there has to be someone out there that is about as nuts as I am and trying to accomplish tasks that seem overwhelming. Not that I’m including you in the “nuts” part of this message 🙂 I would never do that. I think I do, my friend. I think I do. Thank you for sharing this story. It was just what I needed. I am a fairly new fly baby and I have the shiny sink ans simple routines down, as well as WHBH and doing the zones. However I struggle with the laundry. Partly because I have a disability that inhibits my ability to hang the clothes as well as causing me pain from folding. Partly from the fact that I have 5 small children and a DH equaling a lot of laundry. End result… piles of clean unfolded clothes, or piles of dirty ones. Anyway sorry this turned out so long. I decided to dig out all the dirty clothes and seperate them in piles on the floor by the washer so I would be forced to deal with them. Now I have a ton of clothes to fold. I was searching for flylady laundry tips and saw your blog. It helps to know I am not the only one who has piles. Curious question, did Joe let you donate any of the books? I had to go back and read that post. Good for you keeping up with the zones and doing your routines. That is totally awesome! You have quite a family. Reminds me of the chaos and love we had when all our children were home. All grown and gone now. Joe and I blended families and ended up raising eight kids. You want to talk about laundry. I could never keep up with it all. 10 of us in one house. Yikes! Have you considered doing smaller loads of laundry? I know it will take longer for you to get it all done but folding smaller loads might be easier on your aching body. Would your husband help you get the clothes put away in closets if you could get them on hangers and then hung on door knobs? I’m thinking the weight of the clothes and reaching over your head to hang them in closets is what hurts you the most. Are any of your children around the age of 7 or 8? Maybe, with the aid of a chair they can help you hang the clothes. Wish I had an answer for you but I don’t, sorry. Thank you for stopping by my blog and leaving a comment. Hey there your site url: http://message8.wordpress. homepage link. You may want to have this looked at. The Eagles “Hotel California” about sums up truck driving. Dual wheels and Super Singles. 1993 379 Peterbilt is today's flavor.